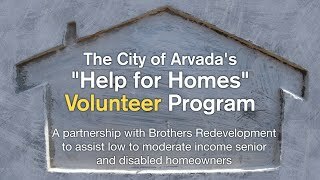 Brothers Redevelopment, in partnership with the City of Arvada, is accepting applications for volunteers wishing to help with their "Help for Homes" program. For more information, visit the Brothers Redevelopment website at brothersredevelopment.org or call them at 303-685-4225. The City of Arvada strives to be a community where residents, regardless of age, mobility or income are comfortable and safe in their homes. With that goal in mind, the City, in partnership with Brothers Redevelopment, Inc., is offering two programs for home repair services for low and moderate income, elderly, and disabled households: Safe and Accessible Arvada and Arvada Help for Homes. or call them at 303-685-4225. Brothers Redevelopment, Inc., was established in 1971 and is a Denver-based nonprofit organization that provides housing and a variety of housing-related services for the region's low-income, elderly and disabled residents.